14th April 2019 at Altnagelvin Hospital, 125 Carnamuff Road, Ballykelly, beloved brother of Eilish Proctor and the late Frances (McLaughlin), Rose and William, brother-in-law of Jack McLaughlin and a much loved uncle and great uncle. Funeral from his sister's home, 31 Castle Park, Eglinton on Wednesday at 11.20 am for 12 o'clock Requiem Mass in St Finlough's Church, Ballykelly. Interment afterwards in the adjoining cemetery. Family flowers only please. 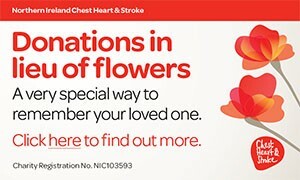 Donations in lieu of flowers if wished to Trócaire C/o W J O'Brien & Son Funeral Directors, 110 Clooney Road, Eglinton, BT47 3PU. I am sorry to tell you that Patrick McGINNIS has passed away.